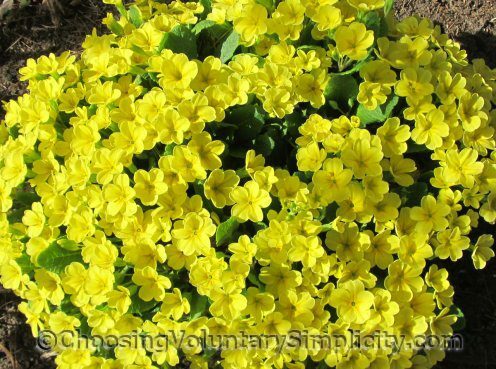 I love the photos you label as gratuitous and yes, I would much rather look at the primroses than potatoes. Please keep sharing your photographs with us. Those primroses are beautiful btw. I wish things were as black-and-white today. I actually prefer very detailed instructions and step-by-step directions. The attitude now seems to be there is no right or wrong way, you just do it, and I think people are missing out on alot if they follow that direction. There is a right way to most things and knowing how to do something corectly is worth alot. Love the 2 p’s and the ‘gratuitous’ photo. Also this blog. It is a wealth of information and interesting reading. And enjoyment too. Keep up the good work. I come here every day. That writer’s disclaimer is priceless!! I can almost feel her restrained frustration that some people can’t (or won’t) follow even the simplest directions. Interesting read here, thanks for sharing.